Kaspar [Clemens Eduard] Zumbusch (1830-1915), 1888 Ritter von Zumbusch (a nobiliary particle), was a German sculptor, born at Herzebrock, Westphalia, who became a pre-eminent sculptor of neo-Baroque monuments in Vienna. He went at the age of eighteen to study in Munich. at first unsuccessfully at the Academy and then Polytechische Schule under Johann Halbig. He continued his studies in Rome. He won the competition in 1866 for a monument to Maximilian II of Bavaria, for the Maximilianstraße, Munich (unveiled 1875). In 1873 he was called to Vienna as professor in the academy, a post he held until he was made Professor Emeritus in 1901. His most important works are a statue of Count Rumford, Munich; and the monuments to Prince August of Prussia (Bellevue Park, Berlin), Beethoven (1873-1880, Vienna), Maria Theresa (1887, Vienna), and to Emperor William I (1896, Wittekindsberg, Westphalia). 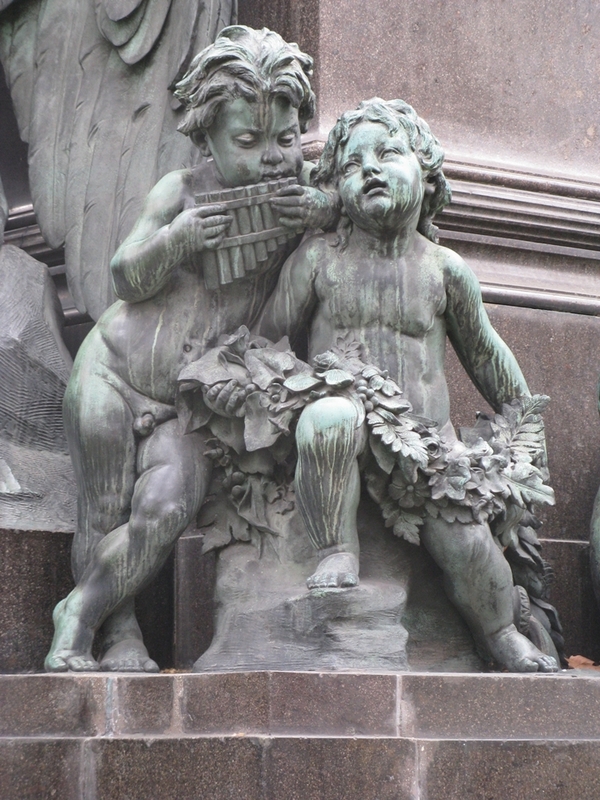 Also in Vienna are his monuments to Count Radetzky (1891) and to Archduke Albrecht (1898-1899). 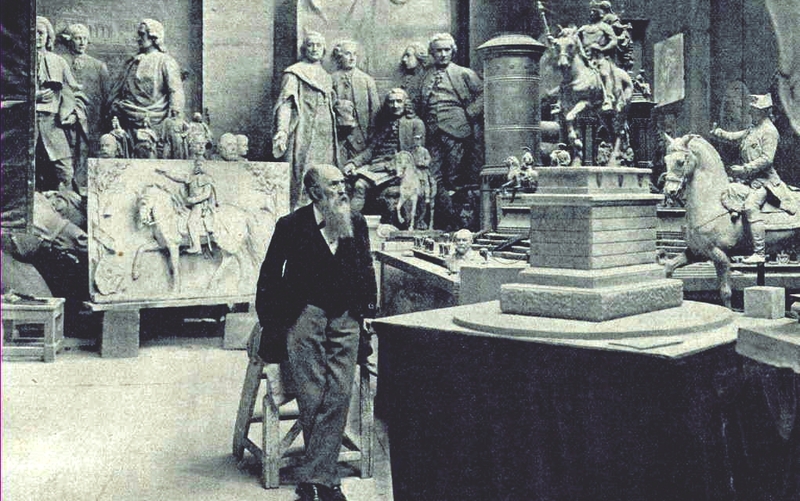 He also modeled many private funeral monuments, decorative works, and portrait busts, including one of Wagner. 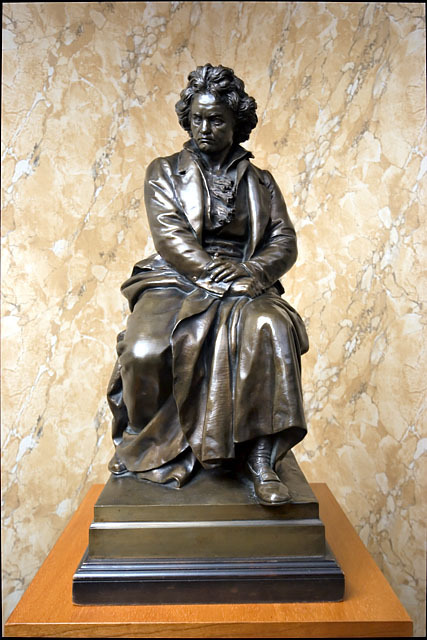 The most famous Beethoven monument from the second half of the 19th century is without doubt the monument created by Caspar Clemens von Zumbusch (1830-1915) in Vienna. It depicts Beethoven as a hero and expresses the meaning of his art by an abundance of allegorican characters. The composer sits high above, far from the beholder on which he looks upon. 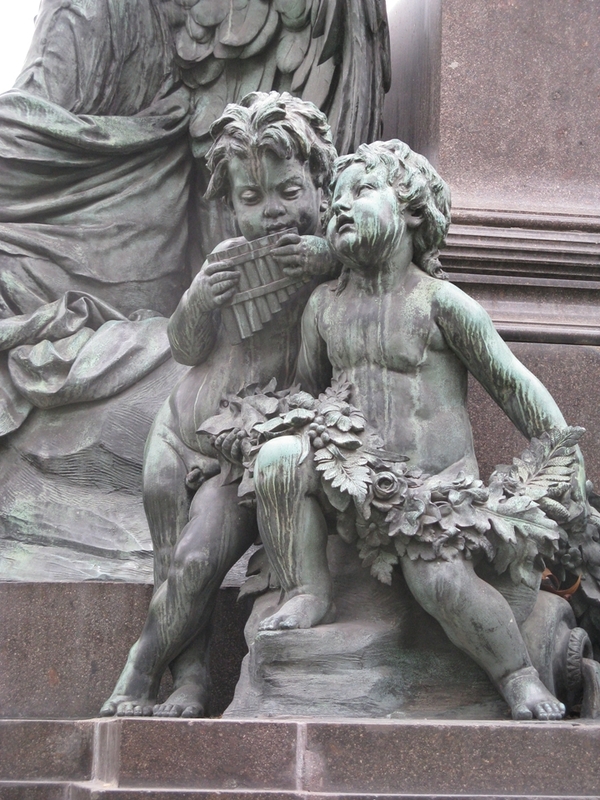 At his feet puttos were placed on both sides of the monument, representing his symphonies and his music in general. The statues of titan Prometheus and Nike, the goddess of victory, stand on both sides. They impersonate the suffering for the sake of humanity and eternal glory. 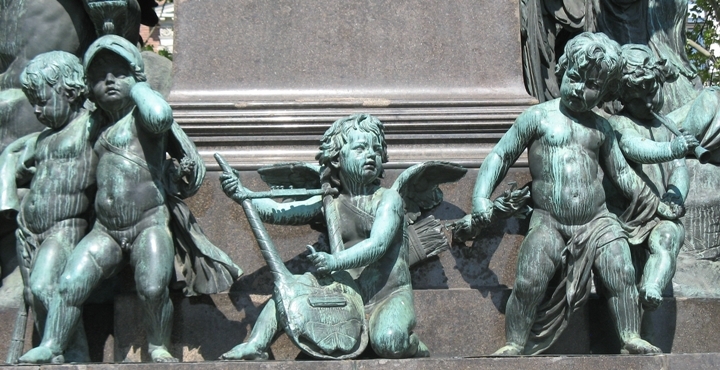 The monuments rests on a three-step base. 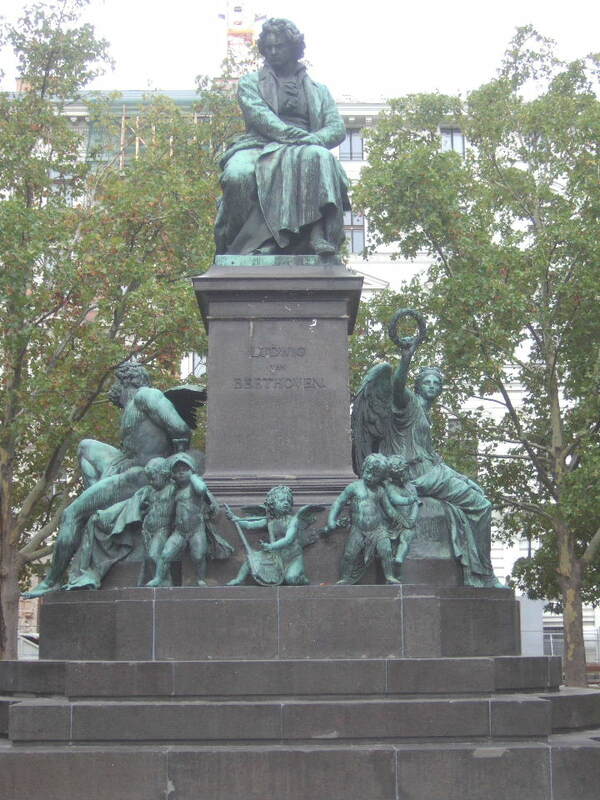 The way Zumbusch designed the monument for Beethoven shows the sculptor's admiration for the composer, typical for Germany and Austria during the second half of the 19th century. In the monument Zumbusch incorporated a series of allusions and hidden hints the educated middle classes of his time were familiar with. Caspar Clemens Eduard Zumbusch, dal 1888 Ritter von Zumbusch, è stato uno scultore Austriaco. Viene considerato come il più importante scultore di plastici monumentali del fine secolo in Austria. Zumbusch con 18 anni si trasferì a Monaco di Baviera, per studiare all'Accademia delle Belle Arti di Monaco di Baviera. Siccome non passò l'esame iniziale passo alla Polytechnische Schule e studiò scultura. Tra i suoi scolari lo scultore friulano Alfonso Canciani. È uno dei principali rappresentanti dello stile eclettico baroccheggiante della seconda metà dell'Ottocento, autore di molti monumenti - a Massimiliano II di Baviera e al conte Rumford a Monaco; a Beethoven, a Maria Teresa, a Radetzky, all'arciduca Alberto a Vienna; a Guglielmo I a Wittekindsberg. 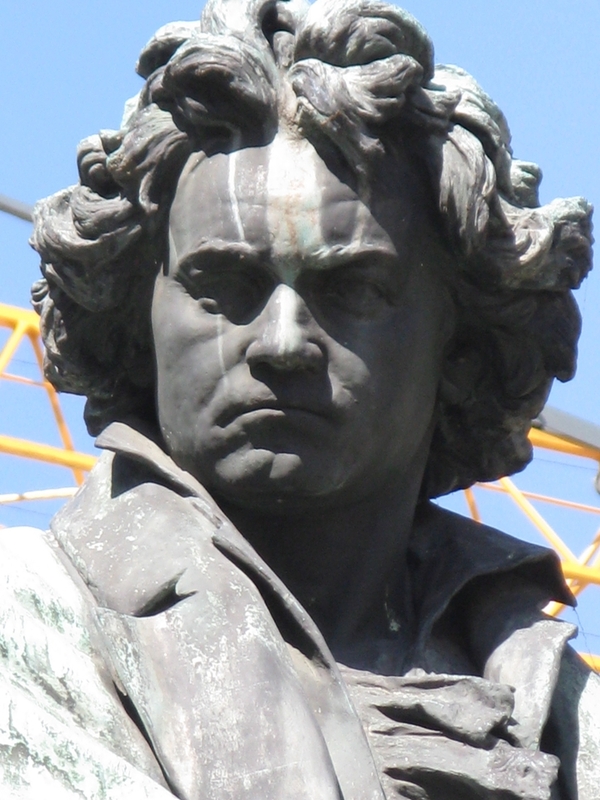 Nel monumento di Ludwig van Beethoven, il compositore appare seduto su un piedistallo sopra le figure che alludono alla Nona Sinfonia.